There has been a lot of "buzz" lately about the health benefits of Goji Berries - people have gone as far as calling them "super fruits" because of their high antioxidant content. There is a ton of information about antioxidants available online, but in short, antioxidants are believed to help slow aging, strengthen your immune system, and improve cardiovascular health, amongst their many other health benefits. 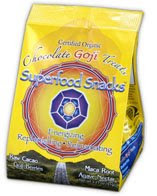 So, having never tried Goji Berries, I was quite intrigued when I found this package of "Chocolate Goji Treats" made by Superfood Snacks when I was shopping at Whole Foods. Inside the bag are "nuggets" that not only contain cocoa powder and Goji Berries, but also contain other raw and natural ingredients like raisins, coconut (which I absolutely love!!! ), and sesame seeds. Each Goji treat looks a like coconut covered date (both in shape and in size). The treats themselves taste very sweet, spicy, and nutty all at the same time, with a strong cocoa aftertaste -- making them totally different and much more interesting than some of things I eat more regularly. I think they are really yummy, but I'm not sure if everyone will, so make sure you try them on a day when you are feeling adventurous. What I really like about these Goji Treats is that 2 of them are only 1 WW point (100 calories, 5g of Fiber), and that they are incredibly tasty and super filling. They also completely satisfy my sweet-tooth/chocolate cravings. I sometimes eat one after dinner for a small but satisfying desert. I came across these Goji Treats at Whole Foods. Whole Foods also sells dried Goji Berries, which I will also be trying soon. I would love to hear if you like them too!